Please see here for Karchers warranty information. The steam cleaning kills bacteria in different environments. The Karcher DE4002 steam cleaner 240v also dissolves grease and stains from:. VAPOHYDRO: infinitely variable steam moisture content. The Karcher DE4002 steam cleaning machine is easy to transport with two large rear wheels and single front castor, and has a practical carrying handle for easy transportation. This steam cleaner comes with on-board storage unit and tidy power cord facility. The DE4002 steam cleaner is excellent for removing burnt-on residue. 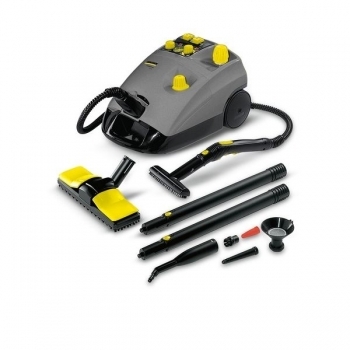 The DE4002 steam cleaner from Karcher can accommodate small items in the accessory compartment. The control panel is clearly laid out for simple and safe operation. Steam jet penetrates the smallest nooks and crannies.